Sitting outside Fulton Recital Hall on a Wednesday, I hear the New Music Ensemble (NME) rehearse for this Sunday’s performance. An onslaught of tense chords and the harried flourishes of strings penetrate the Hall’s oak doors, and anxiety soon seems to consume those sitting outside waiting for classes to begin. Our eyes dart around bewildered, fruitlessly attempting to connect sound and image, as though visuals will beget comprehension of the chords that sound far too coincidental for the ghoulish weekend ahead. The musical stylings of the New Music Ensemble are certainly unexpected. The pieces the New Music Ensemble rehearsed are from newly appointed Assistant Professor Anthony Cheung, as well as from graduate student composers Francisco Castillo Trigueros, Alican Camçi, Marcelle Pierson, and Igor Santos. While the sound of this music has been considered “cutting edge,” the description fails to grasp just how these young composers translate the conventional Western tradition into the modern experience. I sat down with Professor Cheung to discuss his experiences at UC and the New Music Ensemble.Although only in his fifth week of teaching at the University of Chicago, Professor Cheung immediately described his time here as wonderful. After spending the year abroad in Rome at the American Academy, he returned to the U.S. recharged. Cheung currently teaches courses on original composition, as well as an advanced seminar on the composer György Ligeti. His encounters with UC students and their music, including the brief ones with the New Music Ensemble, have nonetheless been beneficial. The ensemble’s exceptional standard of playing certainly speaks to the skill level of NME members who willingly tackle avant-garde compositions. Time’s Vestiges will feature Department of Music Ensemble-in-Residence Spektral Quartet as well as clarinet, horn, bassoon, and piano. Professor Cheung described the combination as “somewhat incongruous” since the bassoon and horn were played largely independent of strings before the 20th-century. However, the new aesthetic direction of composing focuses on sculpting sound, “not for the sake of novelty,” but for “finding one’s voice…through, in some ways, traditional means.” The incongruity of instruments nevertheless seems to combine effectively the modern need to encounter sound with a fresh perspective and the traditional elements of Western musical rhetoric. This modern trend in composition certainly emphasizes the relationship between image and sound. Professor Cheung also stressed the importance of attending these kinds of recitals, even though the music may initially seem inaccessible. Many of these “cutting edge” ensembles now include video components, which further challenge audiences’ preconceived relationship with sound and image. Cheung suggested that the most receptive audience member may be one with very limited knowledge of classical music because they have fewer preconceptions of conventions. 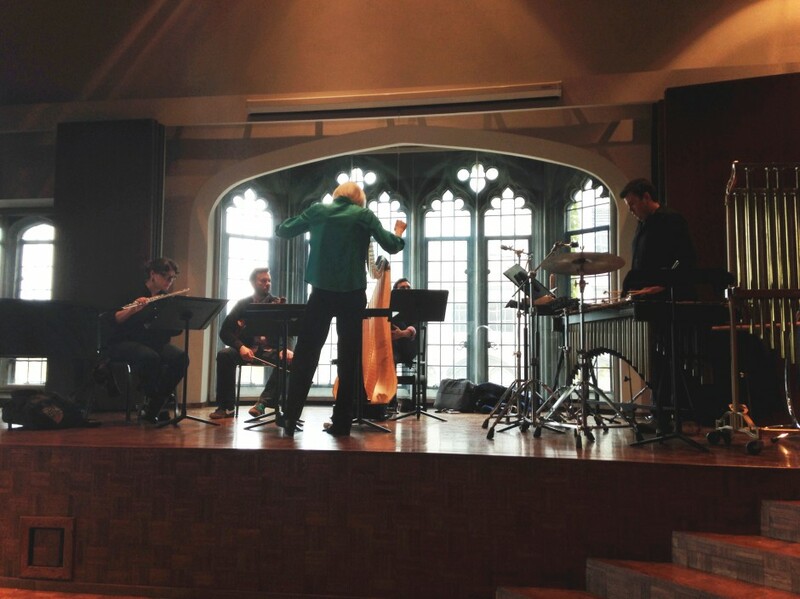 The New Music Ensemble is nonetheless “a great opportunity in that students get to select the instrumentation and work towards writing something that will be rehearsed under the best of conditions.” It is a group of dedicated musicians beneficial not only to UC’s composers, but also to its community members seeking unorthodox auditory and visual stimulation. This entry was posted in Interviews, Media Room, Upcoming Events and tagged Anthony Cheung, Barbara Schubert, composer, composition, Fulton Recital Hall, new faculty, New Music Ensemble, students by Admin. Bookmark the permalink.